Federal Judge Sandy Mattice on Tuesday afternoon ordered Jackie McConell to pay a $75,000 fine and be on probation for three years for horse abuse. Attorneys for the Collierville, Tn. trainer said he will need to sell some of his assets to pay the large fine. The judge gave him nine months to do so. He must also write a letter on the soring of horses, telling about the pain it causes and the longterm effect as well as the type of people who seek out others to sore horses. The letter is also to state how widespread the practice of horse soring is. McConnell also must forfeit a 40-foot horse trailer that was seized. Prosecutor Steve Neff asked that McConnell no longer be allowed to own horses, but Judge Mattice ordered that he inform probation officials on his ownership and involvement with horses during the probation period. The prosecutor said McConnell exhibited "a complete disregard for federal laws over a period of over 30 years." But attorney Tom Greenholtz said, "Mr. McConnell is a man of integrity. Mr. McConnell is a man of honesty. This is not the worst man in the world." Those in the audience included former Senator Joseph Tydings, who was the sponsor of the Horse Protection Act in 1970, and Keith Dane, director of equine protection for the Humane Society of the United States. Mr. Dane said afterward that the trainer "has shown no remorse. For decades his income was based on the torture of horses." He said the federal law protecting horses "was passed 42 years ago and this is only the third person who has been convicted. Only one has gone to jail." Previously, trainer Barney Davis got a one-year sentence and $4,000 fine in Chattanooga Federal Court. His prison sentence was based on obstruction of justice, rather than the horse law. "It's been about the culture, the money, the celebration. They don't give a d--- about the poor horses." In the McConnell case, both sides had agreed that he would receive probation. Judge Mattice asked a number of questions about that condition, asking, "Why should my hands be tied?" After a long discussion and a recess, he said he had decided to accept the plea agreement "in toto." Attorney Greenholtz said the 60-year-old McConnell has a number of health issues and has "no income" since the U.S. Department of Agriculture put down a lifetime ban against him taking part in the horse industry about a month ago. He said his health insurance costs $1,200 a month and medication from $350 to $600 a month. Prosecutor Neff said McConnell on numerous occasions had been able to go around restrictions put on him after he was caught soring horses or set up others to do so. He asked for the same restrictions under the probation as is being set down by the Department of Agriculture. But the judge did not go that far in his order. He said with McConnell "I think this really is a lifetime ban. I think it is different this time." Judge Mattice noted there had been "a media blitz" about the case and he had received hundreds of letters both for and against the defendant. The case gained widespread attention after the Humane Society obtained a secret videotape showing McConnell abusing horses. It was the subject of a TV documentary. Two other defendants, Jeff Dockery and Joseph R. Abernathy got probation. They also are to write letters on the subject of horse soring. Dockery, 54, said McConnell set him up as a trainer and paid for his application. Abernathy, 30, said he is a farrier who was not involved in soring but in transporting horses. Abernathy said, "I do feel remorse and this will make me a better person in the end." McConnell made a short statement in court, apologizing to his family, friends and co-workers. In the wake of the McConnell case, The HSUS has worked with a bipartisan group of federal lawmakers on the introduction of legislation to strengthen the Horse Protection Act (H.R. 6388, the Horse Protection Act Amendments of 2012). We are calling on Congress to take action on the legislation in the lame duck session of Congress. The bill simply fortifies the current law, and the only reason anyone in the Walking Horse industry would oppose this legislation is if they want to continue to sore horses. McConnell and two others are also scheduled to appear in court later this month to face 31 counts of violating Tennessee’s state animal cruelty statute. H.R. 6388, the Horse Protection Act Amendments of 2012, co-sponsored by Reps. Ed Whitfield, R-Ky., and Steve Cohen, D-Tenn., Jan Schakowsky, D-Ill., and Jim Moran, D-Va., will end the failed system of industry self-policing, ban the use of certain devices associated with soring, strengthen penalties, and hold accountable all those involved in this cruel practice. 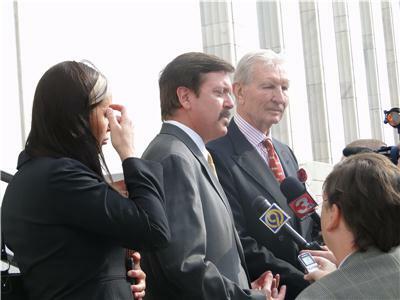 U.S. Attorney Bill Killian said, “The U.S. Attorney’s Office prosecutes cases and enforces the law as it is written. As presently constituted, the defendant’s acts of soring the horses are not themselves federal crimes. They are misdemeanors under state animal cruelty laws. The defendant committed federal misdemeanor offenses when he conspired to transport the sored horses and enter them into nationwide competitions. He committed federal felony offenses when he instructed others to falsify horses’ entry paperwork at the shows to indicate that someone other than the defendant was the actual trainer of a horse. He did this to shield himself from scrutiny as a result of having been disqualified from training and entering horses into competition by administrative sanctions of the USDA. This five-year administrative disqualification stemmed from the defendant’s numerous previous violations of the Horse Protection Act." The U.S. Attorney said McConnell in his plea agreement on file with the U.S. District Court in Chattanooga "admitted to conspiring with others to violate the Horse Protection Act in various ways. At all times relevant to the charges in the indictment, he was on suspension from entering horses into shows. Nevertheless, he continued to train horses by soring, transporting, entering, and showing them at horse shows while on suspension. He trained horses using illegal soring methods such as the application of banned chemicals to the horses’ pasterns, which caused painful burning to their legs. McConnell then arranged for them to be taken to the shows, where he stayed on the grounds outside the warm-up areas, as required due to his disqualified status, and directed others how to show the horse. At the shows, he submitted entry paperwork which falsely stated that someone else was the trainer of the sored horses. He took steps to camouflage the damage to the horses by instructing others to apply magic markers and other masking devices to the horses’ legs prior to inspection." He also said, "The case arose from an undercover investigation conducted by the Humane Society of the United States, which resulted in the creation of evidence instrumental to the case. The USDA Office of InspectorGeneral and Federal Bureau of Investigation conducted the follow-up investigation, including the execution of search warrants at McConnell’s temporary stables in Shelbyville and his barn in Collierville during the 2011 Tennessee Walking Horse National Celebration."